Peale's spare, yet congenial, depiction of the Philadelphian Charles Pettit (1736-1806) projects a tone of composed intelligence and cultivation that befits both artist and sitter. 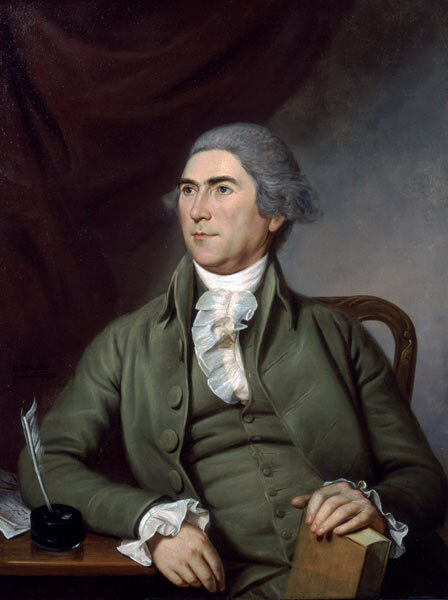 Like Peale, Pettit fought in the Continental Army; later he served in Congress (from 1785 to 1787) and founded the Insurance Company of North America. A well-educated and well-connected lawyer and merchant, Pettit was also a member of the American Philosophical Society and a trustee of the University of Pennsylvania. With his considerable energy, intellect, and personal generosity, Peale epitomized the self-taught Renaissance man during the dynamic years of early nationhood in America. After a brief career as a craftsman in a variety of trades in his native Maryland, he traveled in 1765 to London to study painting with Benjamin West (q.v.). Following the Revolution Peale emerged as the leading painter of distinguished patrons in the Middle Atlantic states. The museum he opened in 1786 in Philadelphia exhibited his portraits of patriots and statesmen along with nature specimens he had collected and catalogued. Peale left a long legacy, as a number of his seventeen children carried on his interests in the arts and sciences throughout much of the nineteenth century.